Out of this oppression runaway slaves formed quilombos (fugitive slave settlements), the largest of which was established in Palmares and survived for almost a century (1602-1695), with a population of 20,000 living in a community with no laws and no masters. Zumbi and his comrades anticipated Tiradentes by two centuries when they tried to set up a nation within Brazil. After independence in 1822, following the Ypiranga Declaration by Pedro I (who would have been Pedro IV of Portugal), Brazil became prey to lots of escapes and popular revolts: in 1823 there were the Setembrada and Novembrada revolts, the Ouro Preto uprising in 1833, the Sabinada in 1837, the Balaiada in 1838, the Cabanagem revolt in 1835-1840, the Guerra dos Farrapos revolt in 1835-1845, the Liberal Revolution in 1842, the Praiera Revolution in 1848 and the Proclamation of the Republic in 1889. Shortly before the latter, on 13 May 1888 the Golden Law abolishing the trade in human beings had been promulgated. Avelino Foscolo in Minas Gerais state, Reinaldo Frederico Greyer in Rio Grande do Sul, Ricardo Gonçalves (there is a street in São Paulo named after him), Benjamin Mota, Edgard Leuenroth and João Penteado in São Paulo, Orlando Corrêa Lopes, Francisco Viotti, Domingos Ribeiro Filho, Lima Barreto and José Oiticica in Rio de Janeiro were the founding fathers. From Portugal came Neno Vasco, a celebrated lawyer who made a name for himself as an anarchist in São Paulo (1901-1911). Together they were all responsible for planting the seeds of anarchism in Brazilian soil. In 1964 the military dictatorship took power and with it came a fruitful period of great activity in the publication of libertarian works. In the midst of repression, writers and publishers stood up to the dictatorship in the decade of greatest repression (1970-1980) and amid the flood of authoritarian trash the researching and publication of anarchist books continued. 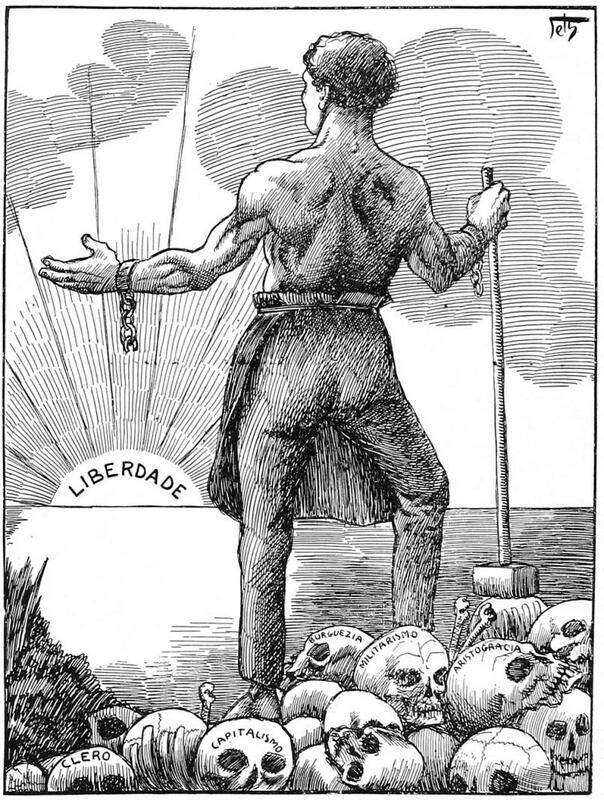 During the 1914-1918 war, Brazilian libertarians were active on several fronts across the country: against unemployment, rising living costs, scarcity of basic foodstuffs, resisting profiteering bourgeois, the mind-bending clergy and a ‘paternalistic’ State that even supplied human cannon-fodder to the battlefields. To ease hunger and under pressure from the libertarian proletariat which was holding rallies at the factory gates, the government gave the go-ahead for direct sale by the producer to the consumer (a process known as free fairs these days) without taxes levied. The First Brazilian Labour Congress - held at the Galician Club at 30-32 Rua da Constitução in Rio de Janeiro from 15 to 20 April 1906 over 12 sessions. They discussed 23 prearranged items plus a supplementary point. Delegates attended from 23 bodies from 5 states in Brazil. One of those attending was the Italian engineer and founder of the Cecilia Colony, Giovanni Rossi. The Second Brazilian Labour Congress - held in the Cosmopolitan Club at 215 Rua do Senado in Rio de Janeiro from 8 to 13 September 1913. Anarchist and anarcho-syndicalist workers held 12 sessions, debating 24 items in the presence of 117 delegates from 8 states, 2 state federations, 5 local federations, 52 unions and 4 libertarian newspapers. The Third Brazilian Labour Congress - in the local of the Textile Factory Workers’ Union at 19 Rua do Acre in Rio de Janeiro from 23 to 30 April 1920. 23 sessions were held in the presence of 39 bodies from 11 states in Brazil. The First São Paulo State Congress - in the Excelsior Hall at 20 Rua Florêncio do Abreu. In all they discussed 3 main items between 6 and 8 December 1906. The First São Paulo State Conference - held in 1907 to draft and decide the agenda for the 2nd State Congress, it discussed a total of 22 items. The Second São Paulo State Congress - held on 7 and 8 April 1908, involving 22 workers’ organisations committed to anarcho-syndicalism. The First Rio Grande do Sul State Congress - held on 1 and 2 January 1898 in the presence of delegates from 10 associations, 1 newspaper and 1 anarchist group. This was the first get-together in Brazil of workers with socialist leanings. The Second Rio Grande do Sul State Labour Congress - held at 30 Rua Comendador Azevedo from 21 to 25 March 1920. Delegates attended from 30 associations, all committed to revolutionary syndicalism. The Third Rio Grande do Sul Labour Congress - 27 September to 2 October 1925. 12 sessions in all in the presence of 23 workers’ associations, the Social Prisoners’ Aid Committee and 2 newspapers. A Declaration of Principles from the IWA was endorsed and an International Anarchist Solidarity Pact was established. The Fourth Rio Grande do Sul Labour Congress - held clandestinely on a date unspecified. 3 sessions over 2 days in the presence of 16 workers’ associations, 2 newspapers, 6 anarchist groups and several São Paulo militants who had fled to Rio Grande do Sul (Florentino de Carvalho, Domingos Passos and others) and delegates from Uruguay, Paraguay and Argentina. The First Minas Gerais State Labour Federation Congress - held in Belo Horizonte in June 1912. A total of 7 items were debated and approved. The Paraná Labour Congress - held in 1907. Present were the Workers’ Federation, established by Italian survivors of the Cecilia Colony, together with the Drama-lovers’ Group, 12 labour associations and a delegate from the paper O Despertar, founded and run by the Italian anarchist Gigi Damiani who was deported from Brazil in 1919. Other congresses - Brazilian anarcho-syndicalist workers took part in or were present at the South American Hatmakers’ Congress held in Argentina and Uruguay in July 1920. Research has established that anarchists were to the fore in every anarcho-syndicalist congress as well as holding their own congresses. The São Paulo Libertarian Conference - held at 39-2n Rua José Bonifácio. In all, it sat on the Sundays 14, 21 and 28 June, 5, 12 and 26 July 1914. Its main aim was to prepare and choose two delegates to represent Brazil at the London Anarchist Congress which was never held because of the outbreak of war. The South American Anarchist Congress - held in Rio de Janeiro from 18 to 20 October 1915 on the premises of the Workers’ Federation at 71 Praça Tiradentes in the presence of delegates from Brazil, Argentina and Uruguay. The International Peace Congress - held from 14 to 16 October 1915. The proceedings took place in the Workers’ Federation local at 71, Praça Tiradentes, Rio de Janeiro in the presence of delegates from the Argentinean FORA and delegates from Chile and Uruguay. The Brazilian Anarchist Congress - held in Nossa Chácara in the Itaim district of São Paulo from 17 to 19 December 1948. It signalled the resurgence of the anarchist movement in Brazil after the collapse of the Getúlio Vargas dictatorship. It drew anarchists from several places in Brazil and a number of veteran Italian, Spanish and Portuguese anarchist militants living in Brazil or passing through. The Anarchist Encounter in A Urca - a national convention. Held on 9 to 11 February 1953 São Paulo 67, Rua Osório de Almeida in Rio de Janeiro, in the presence of more than 30 anarchists. It proved a very productive get-together. Brazilian Anarchist Congress - held in Nossa Chácara, Itaim, São Paulo from 26 to 29 March 1959. Large turn out by militants from all parts of the country including Spanish exiles and some Italians. It was agreed that the Social Culture Centres be reactivated and the Mundo Livre publishing imprint was launched in Rio de Janeiro. In all, a 10-item agenda was discussed. Encounter of Spanish Libertarian Exiles - at the Social Culture Center at 85 Rua Rubino da Oliveira in São Paulo on 7 and 8 October 1961. Attended by Brazilian anarchists and exiles from the CNT and FIJL. Anarchist Encounter - held in São Paulo from 20 to 22 April 1962. 100 anarchist militants from all over Brazil gathered in Nossa Chácara, including some foreign comrades. Five very productive sessions were held. The Tenth Anarchist Encounter - held from 15 to 17 November 1963. Over 100 militants met to discuss the course of the anarchist movement in Brazil. The proceedings were broken up into six main points. May 1964 - clandestine meeting of the anarchists of Rio de Janeiro and São Paulo in Nosso Sitioto plot a course with regard to the military dictatorship installed on 1 April 1964. A number of resolutions concerning the safeguarding of anarchists’ resources came out of this meeting. Encounter in Nosso Sitio - held clandestinely in 1968 in Mogi das Cruzes, São Paulo. Encounter of Pro-COB Groups - held at 85, Rua Rubino de Oliveira in May 1986. Sight should not be lost of the importance of daily newspapers like A Plebe (São Paulo 1919), A Hora Social (Recife 1919), A Voz do Povo (Rio de Janeiro 1920), A Vanguarda (São Paulo 1921-1923), A Lanterna (São Paulo 1901-1934), weeklies like O Amigo do Povo (São Paulo 1903), A Terra Livre (São Paulo-Rio de Janeiro 1907-1910), La Battaglia (São Paulo 1904-1913), Remodelações (Rio de Janeiro 1945-1947), Ação Direta (Rio de Janeiro 1946-1959), and reviews such as Remodelações (Rio de Janeiro 1921-1922), Renascença (São Paulo 1923), A Vida (Rio de Janeiro 1914-1915), Revista Liberal (Porto Alegre 1921-1924) and hundreds of other publications. As part of its educational endeavours, the São Paulo Social Culture Centre recently ran a Libertarian Education Course focusing on the following themes: ‘The Anarchist Movement and Rationalist Schooling in São Paulo, 1912-1919’, ‘Schooling and Work in Today’s Brazil’, ‘Popular Education from Libertarian Education to Liberating Education’, ‘Organisation and Power: The State, The School, The Firm’, ‘Education for Work through the Freinet Method’, ‘Autonomous Struggles and Pedagogical Self-Management’ and ‘An Anarchist Therapy’. Some of those who have helped to shape anarchism in Brazil include - Fábio Luz, João Gonçalves da Silva, Avelino Fóscolo, Ricardo Gonçalves, Benjamin Mota, José Martins Fontes, Ricardo Cipola, Rozendo dos Santos, Reinaldo Frederico Greyer, Pedro Augusto Mota, Moacir Caminha, José Ramón, Domingos Passos, João Perdigão Gutierrez, Florentino de Carvalho, Domingos Ribeiro Filho, Lima Bareto, Orlando Corrêa Lopes, Manuel Marques Bastos, José Puicegur, Diamantino Augusto, José Oiticica, José Romero, Edgard Leuenroth, Felipe Gil Sousa Passos, Pedro Catalo, João Penteado, Neno Vasco, Adelino Pinho, Giovanni Rossi, Gigi Damiani, Artur Campagnoli, José Marques da Costa, Rodolfo Felipe, Isabel Cerrutti, João Perez, Antonino Dominguez, Manual Perez, Romualdo de Figueiredo, Juan Puig Elias, Maria Lacerda de Moura, Rafael Fernandes, Angelina Soares, Paula Soares, Elias Iltchenco, Frederico Kniestedt, Jesús Ribas, Cecílio Vilar, Oreste Ristori, Maria Lopes, Manuel Moscoso, Polidoro Santos, Amilcar dos Santos, Pedro Carneiro, Atílio Peçagna, Rudosindo Colmenero, Maria Silva, Maria Rodrigues, Pietro Ferrua, Pedro Ferreira da Silva, Câmara Pires, Ramiro de Nóbrega, Maria Valverde, José Simões, Manuel Lopes, Vitorino Trigo, Mariano Ferrer, Luiso Magrassi, Sofia Garrido, Joaquim Leal Junior, Lino de Resende, Jaime Cubero - and countless other intellectuals and workers. From: Universo Ácrata (Editora Insular, Florianópolis 1999) [adapted]. Translated by: Paul Sharkey.